Thermo ALU-HOLZ 78mm Energy saving in today’s construction is fundamental. Because of that, the role of the windows with higher thermal parameters is becoming more significant. 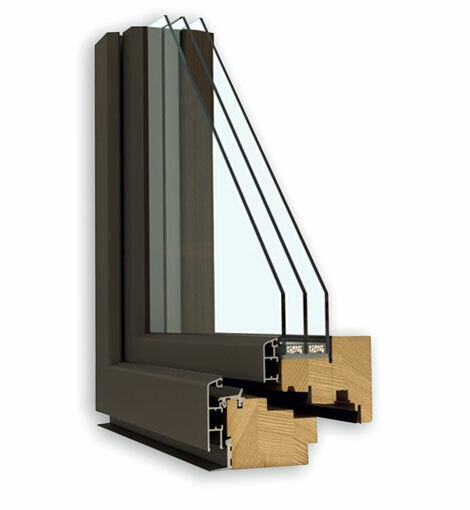 Energy efficiency rating THERMO ALU-HOLZ 88mm windows has been increased by 50% by using glass with thermal conductivity coefficient of U=0,5 (to compare with ALU- -HOLZ 68mm windows with U=1,1). Wooden frame thickness 88mm + 18,5mm aluminium profile from the outside. Any shape and size of the window available. Pine, meranti or oak plus aluminium. Triple glazing unit - 4/16/4/16/4 – double chambered system. Thermal insulation glass of Ug = 0,6 W/m2k. The possibility of obtaining heat transfer coefficient up to 0,5 W/m2k. Choice of any glass panes with maximum thickness of 44/50/56mm, quadrat FB of 58(+1)/64(+1)/70(+1). Distance frame is offered as standard.